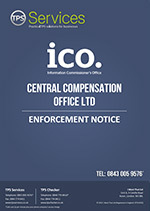 Central Compensation Office Ltd, based in Oswaldtwistle, Lancashire with its registered office in Bury, has been caught calling people registered on the Telephone Preference Service (TPS). Calling people registered on the TPS without their express permission is against the law. The Information Commissioners Office (ICO) launched an investigation after 190 people complained about the calls between April and August 2015, 167 of those directly to the TPS. The company traded under the names Industrial Workers Office and National Advice Clinic. The ICO has issued an enforcement notice requiring the company to stop calling people registered with the TPS. Failing to comply with the notice is a criminal offence, and could lead to legal action.